"...This is WBAH-FM, your 'round the clock home for the Holiday Spirit. We just heard the Mormon Tabernacle Choir and the Metropolitan Opera Chorus, the King's Singers, the Chicago Symphony Orchestra, Lang Lang, Diana Krall, Alison Balsom, the Three Irish Tenors, the Canadian Brass, Metallica, Taylor Swift, Brad Paisley, Beyonce, Andrea Bocelli, the Rolling Stones, Dr. Dre, Willie Nelson, Judy Kuhn, and Lady Gaga, with ad lib accompaniment by the Jingle Bell Barking Dogs, in Andrew Lloyd Webber's arrangement of 'Silent Night.' And now sit back and relax; for the next ten minutes, we'll hear the Choir of King's College, Cambridge in both verses of 'Deck the Halls.'" Just call me Scrooge. I have a problem with the Christmas season and it's--well, it's the music. So much of what bombards us seemingly earlier every year crushes simple folk tunes under massive loads of Classical technique or star-studded commercial exploitation. All those choruses launching into weird--but technically demanding!--harmonies at draggy tempos that dampen the upbeat vigor of the joyous numbers; all those cheesy or goopy pop tunes, many about snow, not about Christmas at all; all that forced gaiety or pretentious ersatz earnestness. At best, much of this stuff leaves me in "cringe and carry on" mode; at worst, it sends me scurrying for the nearest exit as fast as my record collecting couch potato's legs can carry me. And yet music is, or at least should be, an integral part of Christmas, and I do cherish a little core of favorites that I jealously guard against overplaying, allowing them to come out and be heard only in the few days immediately before Christmas and on Christmas Day itself. For me, no Christmas is quite complete without them, and, this being the season of giving, I thought I'd share them with TNT's readership in hopes perhaps some of you may find in them the same kind of joy I have over the years. Christmas Hymns and Carols. The RCA Victor Chorale, Robert Shaw, dir. As I have recounted before in these pages, I grew up in the '60s and '70s as the "straggler" kid of parents who came of age in the World War II era, meaning some of our music went back a ways. Now, in those days, at least up until the 1973 oil crisis, establishments like carpet stores and, especially, tire stores would offer custom-pressed seasonal records at promotional prices every December, and more often than not Dad brought one of them home to augment our library of musical entertainment. Nonetheless, always at its core was this set of records, played without fail every Christmas morning while little I impatiently waited what seemed like hours for Dad's movie light to warm up and then, at last set free, gleefully ripped open the painstakingly wrapped boxes awaiting me under the tree. 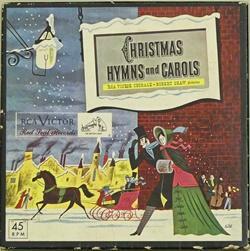 The family copy was on RCA Victor WMO 1077, a set of four clear red vinyl 45s that Dad would stack on the changer and then flip at the midpoint, and I always associated them with red Christmas decorations; later, I learned that these little disks corresponded to an earlier release on 78s, and in due course, after leaving home, I latched onto a copy in that format, which, dubbed to our computer music system, serves me and my family now the same way Mom and Dad's 45s did when I was a kid, except no flipping over is necessary. As to the music, this was celebrated choral conductor Robert Shaw's first Christmas set, and I still consider it the best presentation of "standard" Christmas music I have ever heard, a bracing antidote to poisonously overwrought modern productions of the sort I parodied above. The chorus, a compact group of singers performing a cappella under the name "RCA Victor Chorale," has diction clear as a cold, sunny winter's day and displays the kind of precision and intensity one would expect of a Toscanini orchestra (and, in fact, Toscanini enjoyed working with Shaw, sensing in him a kindred spirit), yet the performances are almost always true to the spirit of the music, technically assured enough for the "professionally composed" numbers but never burying the more folkish songs under gratuitous shows of technical legerdemain. A recording for the ages. Haydn (attr. ): Toy Symphony. Boston Symphony Orchestra, Serge Koussevitzky, cond. This one is something of an inadvertent appendix to the Shaw set. It was another recording originally released on 78 RPM, but my family had it as 45 RPM record WEPR-7, and, as another little clear red 45, it ended up stored in the Shaw set's box and treated as if it were part of that set. Once again, I eventually located a 78 RPM copy (RCA Victor 12-3013), in which form it also continues on as part of my family's Christmas musical festivities. The work is of uncertain parentage; when reccorded, it was commonly attributed to Haydn, but subsequently it came to be assigned to Leopold Mozart, Wolfgang's father; now apparently there's at least one other contender, a gentleman named Edmund Angerer. Regardless, it's loads of fun, with toy instruments and noise makers punctuating the musical line at every turn, and Koussevitzky and his band gave it a crack performance, full of high spirits. Christopher Rouse: Karolju. 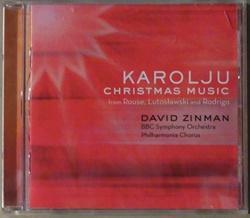 BBC Symphony Orchestra and Philharmonia Chorus, David Zinman, cond. RCA Red Seal 88697-11561-2. If the Shaw set has been part of my life since childhood, this recording from 2007 is a latecomer, one I discovered quite by accident on my car radio maybe five years ago, but in a sense it maintains continuity with its childhood predecessor, because it was inspired by a record not unlike the Shaw 45 collection and even issued under the same corporate aegis (although by the time this CD came out the "RCA Victor" label name had passed on to foreign ownership). Christopher Rouse, for those not familiar with him, is an American composer who served as Composer in Residence of the Baltimore Symphony Orchestra when David Zinman was that group's music director. When Zinman approached Rouse to commission a new choral work for the Christmas season, Rouse proposed to undertake a project he'd contemplated for some years, creating a modern analogue to an old Christmas record he'd enjoyed as a child, which he described as "a non-stop, kaleidoscopic medley of Christmas carols, fitted out in lush choral and orchestral trappings." Rouse wrote music in the style of carols from various foreign lands and then put together texts in the corresponding languages, "words and phrases appropriate to the Christmas season...[but] not intelligibly translatable for long periods of time." The work includes segments in Latin, Swedish, French, Spanish, Russian, Czech, German, and Italian. The one in Latin opens the work and reappears toward the end; one segment, "Little March of the Three Kings," is purely instrumental. Even the title is a fabrication; Rouse coined it by combining the sound of "carol" with an ending of "u," just because he likes words ending in "u." Rouse succeeded well in achieving his stated goal of composing "music that was straightforward in its melody, harmony and orchestration" and "direct and simple in its tonal orientation." (In his program notes, he also goes to great pains to reassure his usual audience that he has no intention of repeating the experiment in his more "serious" music.) Most of the selections are lively and catchy, nearly all are short, and all are easily accessible and tuneful--as Christmas carols, even newly fabricated ones, should be. A brilliant stroke is ending the piece with a slow, contemplative number, lasting better than twice as long as the next longest one, encapsulating the reality that Christmas, for all the happy good cheer surrounding it, has at its heart something of wonder and mystery and awe. On the CD, Karolju is coupled with Polish carols set by Witold Lutoslawski and Spanish Christmas music of Joaquin Rodrigo. The couplings are attractive, but at least so far they haven't won my affections as has Karolju, which quickly has become one of my top holiday favorites. 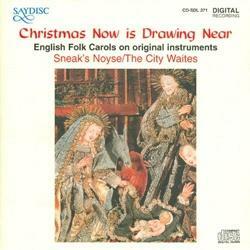 Christmas Now Is Drawing Near: English Folk Carols on Original Instruments. Sneak's Noyse and The City Waites. Saydisc CD-SDL 371. Here's a definite change of character from the foregoing records. If I were to put this in terms of baseball--which I shouldn't, considering how little I know about baseball!--I'd say that Shaw and his group specialize in fast balls, the Saydisc lot in curve balls. Saydisc tends to be an adventurous label, and this issue is no exception: Christmas music much more in the style of the English folk revival, although the selections range from ancient to Victorian. Among my favorites here are "The Boar's Head Carol," with its mix of English and heavily accented Latin, and a tour-de-force performance of "The Holly and the Ivy," alternating two tunes and then superimposing them seamlessly. I also enjoy the way the occasional narrative line can be elliptical in the way of the Child Ballads. I noted above that Shaw's forces almost always nail the appropriate style for each selection they sing; the exception is the "Wassail Song," which in Shaw's hands is slow and a bit sentimental, whereas the present disc reveals this music really is more uptempo and impolite, maybe even a bit raucus. That's understandable if you consider the context from which the two performances sprang. When Shaw, a protege of the very mainstream big bandleader Fred Waring, made his record, raucus and impolite had no place in the formal concert hall, and Shaw was working hard to establish the choral concert as a serious art form that could stand and hold its own beside the "high art" symphony and opera and chamber music. (Note that back then, the seal between "popular" and "classical" artists was nowhere near as hermetic as it is now.) Today, in our more relaxed culture, we're open to more relaxed presentation, allowing this musical demand for a handout to show its true colors. I'm offering a chance to sample both selections below; you be your own judge. Jakub Jan Ryba: Czech Christmas Mass. Jaroslava Vymazalová, sop. ; Marie Mrázová, alto; Benno Blachut, ten. ; Zdenek Kroupa, bs. ; Milan Slechta, organ; Prague Philharmonic Orchestra and Chorus, Václáv Smetácek, cond.. Supraphon 3658 (current number; mine, with cover as shown here, is a reissue under license on Fidelio 1809). This music is a "mass" in name only; its movements are named as is traditional for that form, but's really more of a pastoral cantata. Now, I don't speak a word of Czech, but I can tell you the text can be summed up as something along these lines: Servant: "Hey, master, wake up! A bright star has appeared in the sky! What can it mean?" Master: "It means Jesus is born in Bethleham, and we are all saved! Rejoice! Rejoice!" Angels, servent and master, and assorted hangers on: "Hallelujah! We're all saved by the grace of God! Rejoice! Rejoice!" Not, then, the deepest, most philosophical of works, but rather one that directly, appealingly, and enthusiastically communicates the central message of the season. Ryba (1765-1815) did not lead a happy life; trapped in a poorly paid profession not of his choosing and frustrated in his hopes of becoming a celebrated composer, he ended it by his own hand. You'd never guess that from this upbeat, cheerful music, however, which lives on in the active repertory of his native land, and while he may not have become another Beethoven or Brahms, writing even one work regularly performed for more than 220 years isn't a bad lifetime's achievement. This performance certainly makes as strong a case for this sunny work as I can imagine: the singers and chorus are enthusiastic to a fault, the orchestra provides appropriately lively support, even the organ speaks with a cheerful voice. To quote the psalm, everyone involved makes a joyful noise unto the Lord, and I find the results irresistably infectuous. The recording is hardly new, dating back to the 1960s, but it does full justice to their efforts. Incidentally, I have heard performances of the work in German, and I'd advise you to stick to Czech. It loses a lot when not presented in the original tongue, with its own unique sound. There you are, then: my personal formula for keeping bad Christmas music at bay. I hope perhaps some of it may bring you similar pleasure. As a final Christmas gift for you, here are a few cuts to sample. First, as an introduction to Shaw's style, "The Echo Hymn," a German hymn from the 17th century, and "Patapan," a Burgundy French carol of about the same time, possibly composed by Bernard de la Monnoye. The former shows the chorus in a relatively straightforward, "plain" presentation; the latter is a more elaborate arrangement in which its formidable technique is married to and enhances content. Both performances, having been aimed at American audiences immediately after World War II, are sung in English translation. Then, to contrast the old and new styles, the traditional English "Wassail Song," first a bit of Shaw's recording and then the one by Sneak's Noyse. To quote the famous poem, "Happy Christmas to all, and to all a good night!"